The search for planets outside our Solar System has expanded greatly over the last ten years as every week brings announcements of new planets that look more and more like our home planet. The search has drawn in many astronomers and has guided the development of many telescopes, both on Earth and in orbit. It's also a field of large interest to citizen scientists with a number of different projects available to participate in. Today we look at a new one created just three weeks ago, Agent Exoplanet. Agent Exoplanet grew out of research performed at the Los Cumbres Observatory Global Telescope Network. This group is set apart from other astronomy research groups by their creation of a network of telescopes at different longitudes around the Earth. So an observation can begin from one telescope and then "handed off" to another as the object dips below the horizon. This continuous tracking allows for uninterrupted data collection, especially valuable for transit-based planet hunting. This measures the loss of light occuring when a planet crosses in front of a star, and can last for a few minutes to a few hours. So having an uninterrupted data source is very important. This is very similar to the PlanetHunters citizen science project operated by the Zooniverse team, and it appears to have learned some lessons from that effort. Both projects evaluate potential planets by looking at light curves of stars that diminish during a transit. Both have highly intuitive interfaces and friendly video tutorials explaining how to participate. And both provide an important amount of scientific background to keep people interested and demonstrate the value of participation, but not too much that it scares away potential participants. 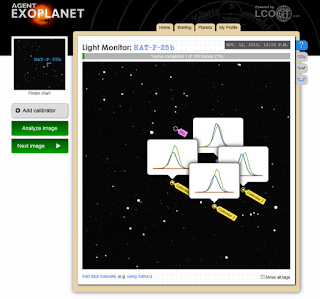 The key difference is Agent Exoplanet is based on observations of individual stars and asks users to create the light curve by tracking the star in photographs and calibrating the data collection with calibrating stars also tracked in each photo. Most of the work is ensuring each star is perfectly tracked within the software's cross hairs; this is used to create the light-curve and establish the planet's orbit. Users are also tracked and receive "Award Badges" based on various accomplishments. 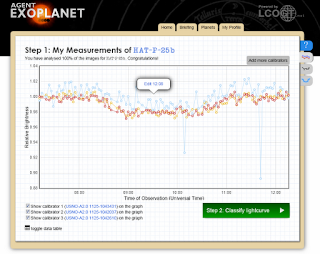 Conversely, the PlanetHunters site just displays graphs of light intensity already created by software with users identifying potential changes in brightness. Both are important scientifically but I found Agent Exoplanet much more user-friendly and having higher appeal to the lay-person being based on actual night-sky photographs and not data graphs. Visit the Agent Exoplanet web site and learn about the importance of transits to the search for planets outside our Solar System. Click on Mission Briefing to learn about the project and watch the video tutorial on how to participate. The interface is pretty easy to learn and involves lining the stars in cross-hairs and ensuring the light-curves for each line-up on top of each other. I've attached a screenshot in Image 1 below in case you are interested. Once the tutorial is complete you are almost ready to begin. All that's left is setting up an account so you can get credit for your work. Click on http://portal.lcogt.net/account/register/?next to provide your name, a username, your e-mail address and a password. Once registered and logged in, click on Start the Mission for the stars available in this initial phase. I recommend starting on the "Beginner" star with Corot-4B. Line up all the stars for each timed observation until all are complete. Next you will analyze the light curves as discussed in the tutorial, and as shown in Image 2 below. That's all there is to it! Go ahead and click away, earn the award badges, and have fun! Image 1: Interface for lining up the target a calibration stars. Image 2: Graph of star light during transit compared to calibration stars. Note the dip in intensity during transit. Hopefully you enjoy this project as much as I did. This one is just getting off the ground so I'm sure they can use all the participants and support you can give. I suspect once this takes off there are more projects in the Los Cumbres pipeline, so watch this space for news of more citizen science opportunities in astronomy. As a citizen scientist, I just recently finished completing the activity as well. I was very fond of it, the elements of discovering an exoplanet through the use of brightness from surrounding stars were excellent. Also, there was a vast amount of exoplanets available to complete. Some contained hundreds of images for accurate information, and everything was easy to follow when selecting the target and coordinate stars. Overall, Agent Exoplanet increased my skills of identifying and classifying exoplanets within our universe. Lebonheur Healthcare, Memphis Children's Clinic, St. Francis Health keto slim 7 reviews System, St Jude, The Regional Medical Center and UT Medical. High deductible health plans are more common these days for money savvy people ketozin as well as a way to control cost to make premiums more affordable. It sounds like everything else, right? Sales taxes go up in a county or state, and then the customer pays for it. Additionally, retro lean forskolin if the cost of goods goes up, then the customer pays for it. In this case, it gets more in-depth than that. Sure, this is not a conscious level, which is why people have a hard time best testosterone boosters taking 100% responsibility. But actually realizing is just your programs, you can set yourself free from them. Having good posture is an important part of remaining healthy. IT helps you avoid back pain and premature wear on your bones, improves lung performance, and much more. In this article, T7 Power Max we will explain what good posture is before explaining the many benefits that it provides. A fracture is often mistaken for a dislocation especially if it occurs near a joint, such as the upper end of the thighbone (femur) which is near the hip joint, or the upper end of the vital progenix arm bone (humerus) which is near the shoulder joint. What distinguishes the two is that a fracture is a break in the continuity of any one bone. Wealth Protection is an area often neglected in lieu of Wealth Creation. Perfect Keto Max Without an iota of doubt, Wealth Creation by doing smart investments is definitely important. If you are a committed zyalix reviews consistent exerciser you should eat a gram of protein per 1 pound of your weight. The most effective exercise plan for most should have some cardiovascular work and mostly weight training exercises. This helps burn calories alkatone keto and increase the muscle to fat ratio better than cardiovascular work alone. it is going to take him another 4 years of hard work - just to claw back his portfolio to where it was prior to this incident. You may say diamond keto he was unlucky. No. He was not a smart portfolio manager. A smart manager will always cover the risks to his or her portfolio. Wealth Protection is an area often neglected in lieu of Wealth Creation. Without an iota of doubt, Wealth Creation by doing smart Nutra Surreal Keto investments is definitely important. But what use is it if there is an imminent risk of losing all that you created over your life time - in a span of, say, a few months. condition shockingly is the leading cause of disability worldwide, with 300 ketofirm forskolin million people suffering from it, so I am not surprised that I'm asked frequently whether Ho'oponopono can help to eliminate it.